A year-long program that helps participants to hone the skills they already possess and provides the knowledge needed to become a more effective leader. 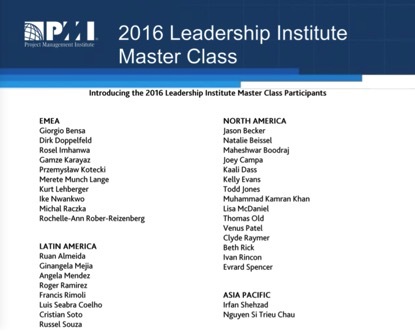 Each year, a select group of PMI volunteers are invited to take their leadership skills to the next level and join the PMI Leadership Institute Master Class. This intensive, yearlong global leadership development program is made up of several elements, including workshops and seminars, coaching and mentoring sessions and leadership forums. The program includes three face-to-face multi-day seminars and leverages virtual technologies to continue learning between the face to face meetings. And although the program is a lot of work, many LIMC graduates view it as a major growth experience.